A 50-year-old male patient reported to the dental hospital with a complaint of painless swelling in the lower left body of the mandible since 25 days following the extraction of left lower 1st and 2nd molar teeth. The patient had a history of enlarged submandibular lymph node and fever since 15 days which was earlier thought to be due to infection after extraction. The swelling was insidious in onset and gradually increased in size causing facial asymmetry [Figure 1]. Examination revealed a nontender, solitary diffuse swelling measuring 3.5 cm × 3.5 cm in the lower left body of the mandible. The swelling was fixed, firm to hard in consistency. Intraorally, the swelling extended from left premolar till left ascending ramus of mandible obliterating the buccal vestibule, with buccal cortical plate expansion [Figure 2]. Orthopantomogram of the patient was done to evaluate the invasion of the lesion and pathological fracture of lower left body of mandible [Figure 3] was seen. Histopathological picture showed the lesion to be composed of dysplastic parakeratinized stratified squamous epithelium overlying connective tissue stroma. Basement membrane is indistinct at few places with infiltrating epithelial cells seen in the connective tissue. The connective tissue stroma is highly cellular in nature. There are diffuse proliferations of large atypical lymphoid cells showing dysplastic features such as nuclear and cellular pleomorphism, nuclear hyperchromatism, increased number of nucleoli and abnormal mitotic figures. Some areas show invasion of neurovascular bundles. Cells are highly anaplastic. Multinucleated giant cells are also seen. The above-mentioned findings favored the diagnosis of large cell lymphoma [Figure 4]a and [Figure 4]b. Following this, immunohistochemical analysis was done for the expression of pan B-cell markers CD20, CD3, bcl-2, CD5, CD10 and Ki67. 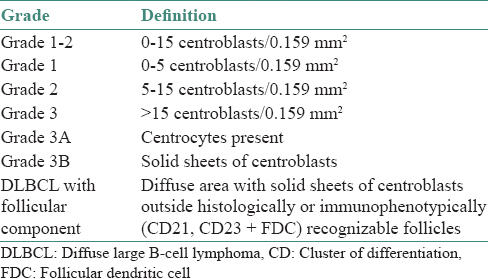 CD20 and bcl-2 were positive in medium and large lymphoid cells in follicle and diffuse pattern. CD3 and CD5 were positive in few scattered lymphocytes. 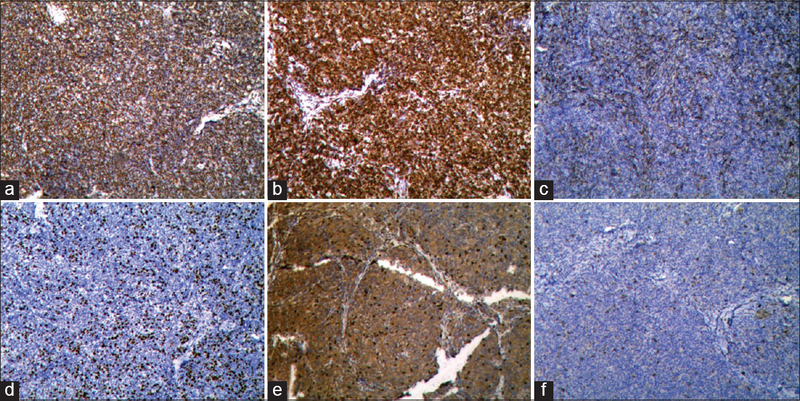 CD10 was positive in few focal areas and Ki67 was positive in 30% area [Figure 5]a,[Figure 5]b,[Figure 5]c,[Figure 5]d,[Figure 5]e,[Figure 5]f. Based on immunohistochemical report, the lesion was diagnosed as DLBCL anaplastic variant (70%) and FL, grade 3A (30%). The WHO classifications of 2001 and 2008 recognized three grades - FL1-2, FL3A and FL3B [Table 1], based on the number of centroblasts present per high power field; the difference between FL3A and FL3B is the presence of a mixture of centrocytes and centroblasts in FL3A and the presence of follicles existing exclusively of centroblasts, immunoblasts or both in FL3B. The fact which supported the continuation of a grading system is that grades predict outcome, higher grades being associated with poor clinical outcome and more rapid progression to DLBCL. Mahima VG, Patil K, Raina A. Extranodal non-Hodgkin's lymphoma. 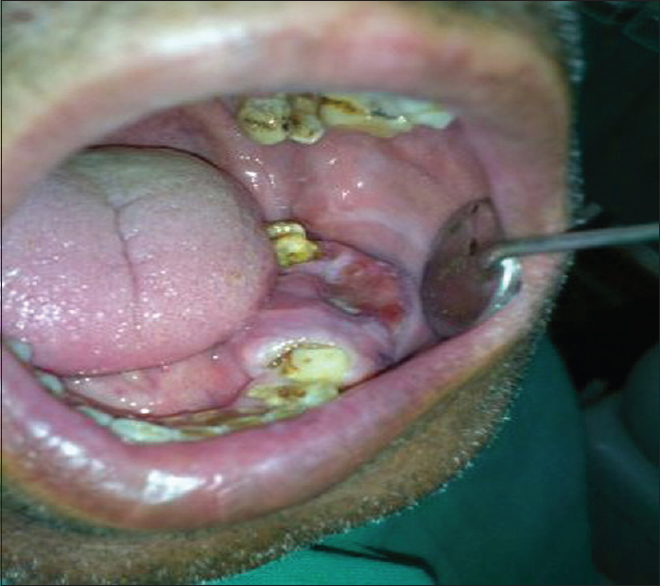 An unfamiliar presentation in the oral cavity: A case report. Int J Clin Cases Invest 2010;vol1 (1) 7-12. Razmpa E, Saedi B. Clinical features of extranodal presentation of non-Hodgkin's lymphoma in head and neck. Acta Med Iran 2009;47:489-92. Martinez-Climent JA, Alizadeh AA, Segraves R, Blesa D, Rubio-Moscardo F, Albertson DG, et al. Transformation of follicular lymphoma to diffuse large cell lymphoma is associated with a heterogeneous set of DNA copy number and gene expression alterations. Blood 2003;101:3109-17. Adouani A, Bouguila J, Jeblaoui Y, Ben Aicha M, Abdelali MA, Hellali M, et al. 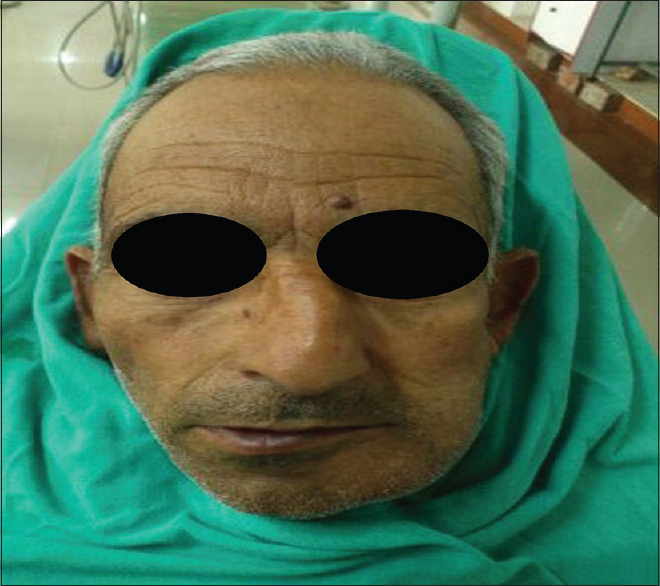 B-cell lymphoma of the mandible: A case report. Clin Med Oncol 2008;2:445-50. Swerdlow SH, Campo E, Harris NL, Jaffe ES, Pileri SA, Stein H, et al. WHO Classification of Tumours of Haematopoietic and Lymphoid Tissues. 4th ed. Lyon: IARC Press; 2008. Coiffier B. Diffuse large cell lymphoma. Curr Opin Oncol 2001;13:325-34. Bhattacharyya I, Chehal HK, Cohen DM, Al-Quran SZ. 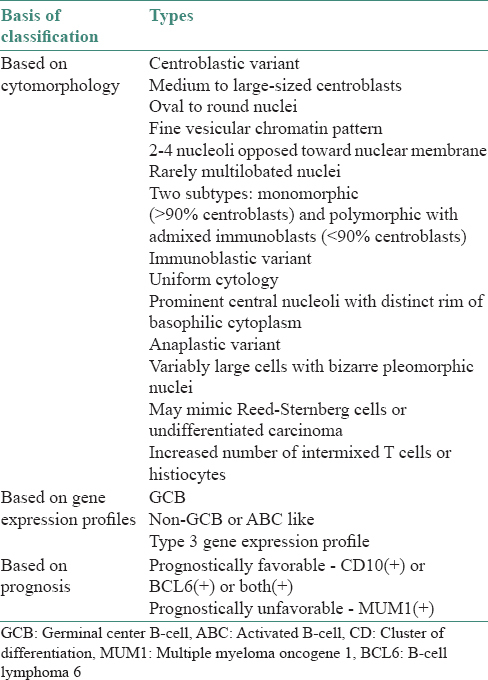 Primary diffuse large B-cell lymphoma of the oral cavity: Germinal center classification. Head Neck Pathol 2010;4:181-91. Ioachim LH. Ioachim's Lymph Node Pathology. 4th ed. Philadelphia: Lippincott; 2009. p. 423. Eisenbud L, Sciubba J, Mir R, Sachs SA. Oral presentations in non-Hodgkin's lymphoma: A review of thirty-one cases. Part II. Fourteen cases arising in bone. Oral Surg Oral Med Oral Pathol 1984;57:272-80. Barber HD, Stewart JC, Baxter WD. Non-Hodgkin's lymphoma involving the inferior alveolar canal and mental foramen: Report of a case. J Oral Maxillofac Surg 1992;50:1334-6. Kemp S, Gallagher G, Kabani S, Noonan V, O'Hara C. Oral non-Hodgkin's lymphoma: Review of the literature and World Health Organization classification with reference to 40 cases. Oral Surg Oral Med Oral Pathol Oral Radiol Endod 2008;105:194-201. Maeshima AM, Omatsu M, Nomoto J, Maruyama D, Kim SW, Watanabe T, et al. 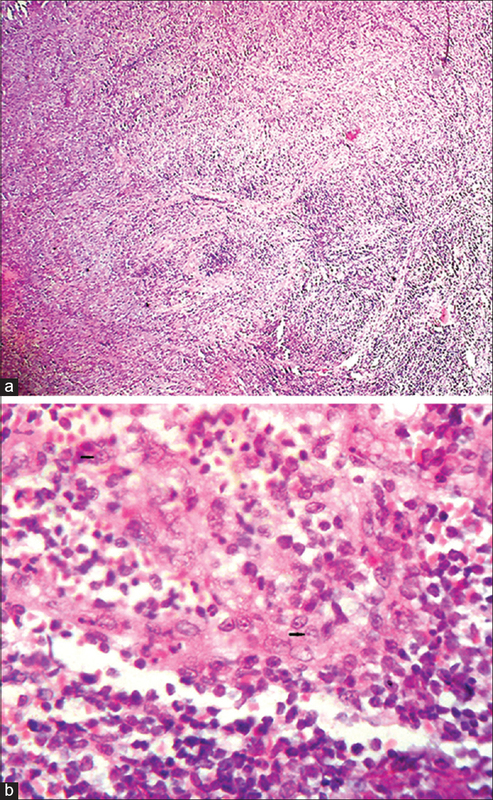 Diffuse large B-cell lymphoma after transformation from low-grade follicular lymphoma: Morphological, immunohistochemical, and FISH analyses. Cancer Sci 2008;99:1760-8. Harris NL, Swerdlow S, Jaffe E. Follicular lymphoma. In: Swerdlow SH, Campo E, Harris NL, Jaffe ES, Pileri S, Stein H, editors. WHO Classification of Tumours of Haematopoietic and Lymphoid Systems. 4th ed. Lyon: IARC; 2008. p. 220-8. Dominis M, Dzebro S, Gasparov S, Pesut A, Kusec R. Diffuse large B-cell lymphoma and its variants. Croat Med J 2002;43:535-40. Hsi ED, Yegappan S. Lymphoma immunophenotyping: A new era in paraffin-section immunohistochemistry. Adv Anat Pathol 2001;8:218-39.
de Leval L, Harris NL. Variability in immunophenotype in diffuse large B-cell lymphoma and its clinical relevance. Histopathology 2003;43:509-28. Jaffe ES. Pathology and Genetics of Tumours of Hematopoietic and Lymphoid Tissues. Lyon: IARC Press; 2001. p. 172-3. Chang KL, Arber DA, Weiss LM. CD20: A review. Appl Immunohistochem 1996;4:1-15. Lin AY, Tucker MA. Epidemiology of Hodgkin's disease and non-Hodgkin's lymphoma. In: Canellos GP, Lister TA, Sklar JL, editors. The Lymphomas. 1st ed. Philadelphia: Saunders; 1998. p. 43-60. Niu H. The proto-oncogene BCL-6 in normal and malignant B cell development. Hematol Oncol 2002;20:155-66. Dent AL, Vasanwala FH, Toney LM. Regulation of gene expression by the proto-oncogene BCL-6. Crit Rev Oncol Hematol 2002;41:1-9. Lossos IS, Czerwinski DK, Alizadeh AA, Wechser MA, Tibshirani R, Botstein D, et al. Prediction of survival in diffuse large-B-cell lymphoma based on the expression of six genes. N Engl J Med 2004;350:1828-37.